Sit on an exercise ball with your feet flat on the floor. Gently place your hands on either side of your head like you are doing a normal crunch. Keeping your elbows out and your chin lifted (as if you are holding a ball between your chin and your neck), tighten your abdominals to bring your torso up. Hold for one second and lower back to start position. Twist your torso to the right by bringing your shoulder off the ball. Return to neutral position and repeat. Complete on right side before changing to left side. Start on all fours with your stomach on an exercise ball and your hands and feet on the floor. Roll forward on the ball until your shins are the only part touching the ball. Keep your body in a straight line by contracting your abdominals and keeping your shoulders directly over your wrists. This is start position. While exhaling, slowly roll the ball forward by bringing your knees into your chest and slightly lifting your hips. Be sure to keep your elbows straight and your abdominals tight. While inhaling, straighten your legs back to start position. 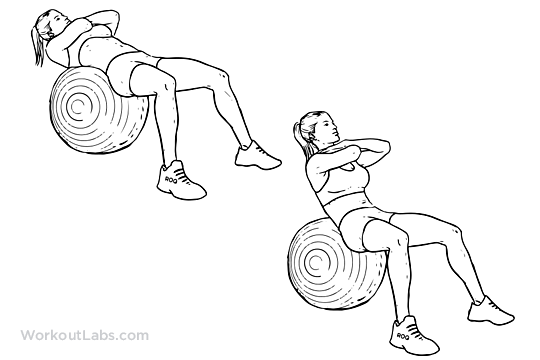 Get into plank position with your forearms supporting you on an exercise ball and your chest lifted off the ball. Hold the position as long as you can while keeping your abdominals tight and your body in a straight line. Try not to let your hips sag or raise. Get into plank position with your forearms supporting you on an exercise ball and your chest lifted off the ball. Your legs should be fully extended so you are balancing on the balls of your feet. While keeping your forearms on the ball, abdominals contracted and your body in a straight line, roll the ball forward by rolling through your feet until you are on your toes. Hold for one second and roll the ball back until you are on the balls of your feet and in starting position.